The group of plants I get excited about each year are the Mississippi Medallion selections. Every year, I promote this group of plants through Southern Gardening so you will look for them at local garden centers. The Mississippi Medallion winners for 2019 are Whopper Begonia, a collard green, Blue My Mind Evolvulus, Nyssa sylvatica and Sweetie Pie blackberry. I’m going to highlight each plant individually this year. Since it was established in 1996, Mississippi Medallion has recognized more than 70 great landscape and vegetable plants. The program was established by the Mississippi Nursery and Landscape Association in cooperation with the Mississippi State University Extension Service and the Mississippi Department of Agriculture and Commerce. It increases awareness of plant materials and promotes the sale and production of ornamental plants in Mississippi. Compared to national campaigns such as All-American Selections and Perennial Plant of the Year, Mississippi Medallion focuses on plants adapted to Mississippi’s environment to benefit both consumers and the green industry. 2019 marks the second time in Mississippi Medallion history that an evolvulus has been chosen. This year it is Blue My Mind. The first evolvulus was Blue Daze, which has been around for a long time and was one of two plants chosen as the first Mississippi Medallion winners in 1996. 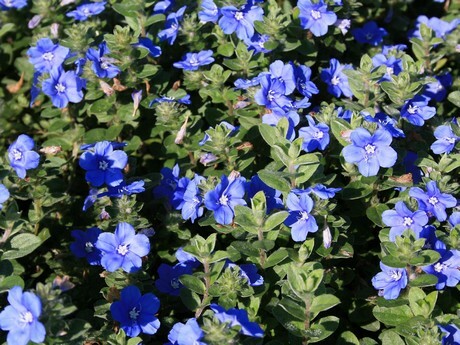 Blue Daze has fantastic, true-blue, funnel-shaped flowers. I like the fast-spreading growth rate that makes Blue Daze a good ground cover in front of an Indian hawthorn planting in my front landscape. As good as Blue Daze is, there’s an even better evolvulus choice for 2019. Blue My Mind is a fantastic improvement of Blue Daze evolvulus. The individual flowers continue to be funnel-shaped, and they always form near the shoot tips. Blue My Mind is a prolific bloomer. Its foliage has a downy appearance, and the 1-inch flowers are sky blue. The flowers only open for one day. They are brilliant blue in the morning but look quite spent by afternoon, especially in planting beds that face west and receive a high heat load each afternoon. I’ve grown Blue My Mind in my landscape as an evaluator for the past three years. I can attest that a little afternoon shade helps ease the summer heat load, but too much shade reduces total flowering. Blue My Mind and Blue Daze need to be planted in well-drained soil that is consistently moist. Be sure to maintain fertilization to keep the flower production at its peak. I like using water-soluble fertilizer along with the irrigation. As you shop this spring, be on the lookout for this great plant. You can ask your favorite garden center now to make sure they will have these plants available for your landscape.